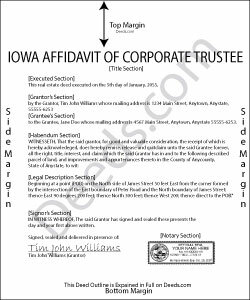 Under Iowa Code 614.14, the affidavit of corporate trustee is used in conjunction with a trustee's deed executed by a corporate trustee. The affidavit is a sworn statement confirming the title held by the corporate trustee is free and clear of adverse claims. It is recorded and presented to the purchaser along with the trustee's deed. Consult a lawyer with questions about corporate trustee's deeds and affidavits.